Bryan Moscatello is half the chef he used to be. No, wait, hear me out! His food is still fantastic! I mean that he’s literally half the chef he used to be. (OK, maybe two-thirds, if you want to be picky about it.) Since we first met Chef Bryan in April at Zola Wine & Kitchen, he’s dropped 75 pounds. How does the executive chef and partner with Stir Food Group sample pasta and other dishes all day and manage to lose weight? Four words, folks: Calories in, calories out. “I’ve changed the quantity of food and eat a good breakfast,” Moscatello said, as I smiled, positively agog at the dedication and discipline it takes to make such a dramatic change. He exercises for two hours each day most days of the week. Eating a solid breakfast each morning is one of his keys to success, and the value of eating a good meal every morning is supported with research from the dietetic community. Moscatello scrambles eggs with cheese and tomatoes and roasts potatoes. 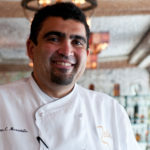 Chef Bryan lamented the use of ingredients like cooking spray; there is no replacement for the real ingredients, he said, thus he always uses butter and olive oil. For lunch, “I’m tasting through the kitchen. I eat a salad with protein and dressing. I’m not skipping things like dressing.” Like many chefs, Moscatello eats at restaurants to experience what his colleagues create in their kitchens, so he still eats out about twice a week. Alcohol contains many satisfying-yet-empty calories, so Moscatello will opt for cocktails or wine instead of beer. But I digress. The original purpose for meeting at Potenza a couple of weeks ago was to talk about gluten-free dining options for people who are sensitive to gluten and still want to enjoy pasta. “We offer spaghetti and fusilli for guests who can’t eat gluten,” Moscatello explained. Samantha Lewandowski, Every Food Fits’ talented and educated registered dietitian will dig deeper into the question about “who can’t eat gluten,” so we’ll hold off on addressing celiac disease or wheat allergies for the moment. Back to Potenza’s unique offerings. At Potenza, many types of pasta are made in-house, such as the noodles or “long” pastas and even some of the shaped pastas. Though not made in-house, their gluten-free pastas are “corn-based, sweeter than traditional wheat-based pasta. Al dente corn fusilli doesn’t hold up as well in a heavy red sauce. There’s no gluten to hold it together.” Gluten-free pasta isn’t quite the real thing, but diners who think that an Italian meal is out of the question can think again. 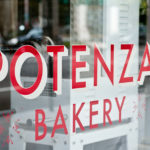 Potenza is more than Italian restaurant, too, something I discovered when I arrived early at 15th and H streets in Northwest D.C.
My habit of getting places way ahead of schedule paid off in spades. 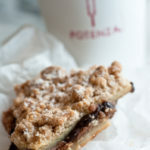 I discovered Potenza’s bright, cozy bakery attached to the restaurant and sat down with a cup of coffee and Nutella bar. Yes, that’s right, a Nutella bar. 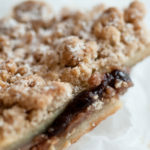 I tried to eat the whole thing – including all of its crumbled coffee-cake-style topping – but realized that a Nutella overdose/food coma would make conducting an interview quite the challenge. The location also boasts a large bar and huge, cozy dining room where guests can view what’s going on in the kitchen. 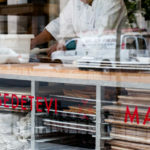 Moscatello’s family influences come into play in the back of the house with his grandmother’s recipe for crepe-style manicotti, which she brought to the States from Italy. Even Potenza’s dipping oil for the table bread is a unique combination of extra virgin olive oil, balsamic vinegar, shallots, garlic, oregano, chili flakes, Italian chili spice, salt and pepper. As the seasons and available local produce change, one thing that won’t change at Potenza, located just a couple of blocks from the White House, is the quality of the meals. What can guests expect to enjoy in the fall? He explained his love for seasonal ingredients. “We’re taking the next step with seasonality. If I couldn’t get it from my farmers, I’m not going to get it.” Local produce vendors who grow plants without soil, like Endless Summer Harvest in Purcellville, Virginia, allow Moscatello to serve guests salads and otherwise out-of-season ingredients year round. Moscatello is always searching for ways to preserve today’s seasonal ingredients to be enjoyed tomorrow. “Planning is involved to extend the life of the fresh product into future seasons.” Pickling is just one way to use the summer tomato harvest in winter dishes and not waste items that would otherwise get thrown away. He’s inspired by the way in which Europeans eat, the “care, appreciation, and love for what the product could be,” is something that he thinks is becoming more mainstream in America today. “Value is the product you receive and the desire to experience it again,” he said. “I’d rather enjoy six ounces of great meat from a great source” than a larger quantity of a mediocre product. DISCLOSURE: I enjoyed a remarkable meal compliment of Potenza several weeks ago. In no way did any portion of the gratis meal influence what I’ve written about the restaurant. Not even the booze-soaked bellini frozen pop. Every Food Fits is at the beach! Myth or Truth: Gluten-free diets…a “sticky” subject. I want to travel to D.C. just so I can lay eyes on this gorgeous man in person! Fugettabout the restaurant (ok, maybe not…. nutella bars?? mmmm), I’d like to just take in Bryan’s handsome face and smile – oh! that smile. Meow! Nicely written article; much homage to Potenza, pasta, pumpkin, and popsicles. 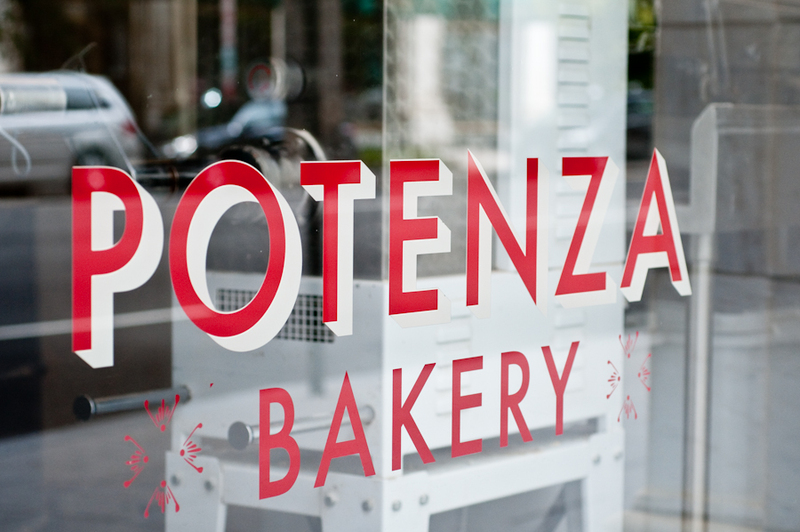 Potenza | Gluten Free? Gimme Three!